Update 15/05/2016: I’ve added a couple more premium calendars to the list. A port of the bootstrap calendar widget to AngularJS (no jQuery required!). A complete AngularJS directive for the Arshaw FullCalendar. FullCalendar is a jQuery plugin that provides a full-sized, drag & drop event calendar like the one below. own feed format. It is visually customizable with a rich API. you how to make a calendar using AngularJS directives among other tools. options for minimum and maximum date, start view and the depth of the navigation. 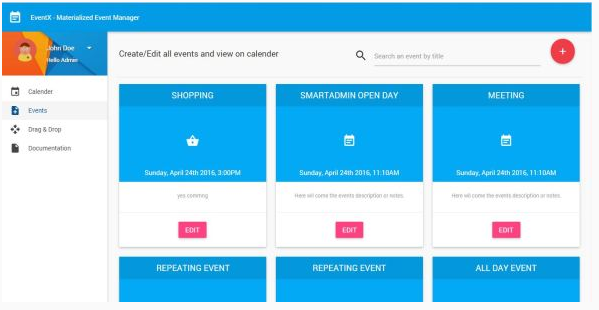 DayPilot includes an Event Calendar AngularJS plugin that will let you use the event calendar component with AngularJS and take advantage of the smooth data binding. Real time sync data from any client, Authentication with role, Realtime updates – Any changes to database is updated in Realtime, Token expire time, Session management, Login, Change Password, Password encryption with , HA1, Automatic minification, compression, CDNify during deployment, Live reaload while development, Auto selection of resources for development and production, API with role based authentication, SEO optimized title and more. 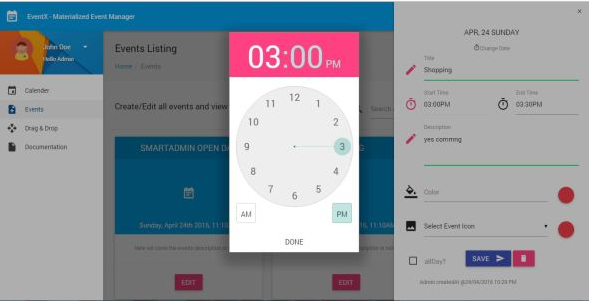 Pingback: ionic framework, AngularJS에서 사용할 만한 calendar component | Hosik. C.